YOLK, the solar company known for its million-dollar-selling Solar Paper on Kickstarter, launched its new SunMade Cheese project. SEOUL, KOREA, August 29, 2018 — YOLK, the solar company known for its million-dollar-selling Solar Paper on Kickstarter, launched its new SunMade Cheese project. The practical objet d'art comes with a solar panel shaped like a cheese plate and solar powered accessories that demonstrate how everyone can beautifully incorporate solar into our everyday lives. The product may sound quirky – and it is – but with Sunmade Cheese YOLK has created a playful, functional, and high-brow project that combines the utility of solar panels with one of their favorite bovine-divined products, cheese. “The SunMade Cheese project is more about enjoying solar power and promoting education for solar technology, but the Solar Cow is really a lifeline for people. They are two projects for two different perspectives, but combined in one initiative.” said YOLK CEO Sen. The cheese plate that serves SunMade Cheese's base is a gently curving oval. Transforming it from a decorative plate into a high-tech solar panel is as simple as flipping it over. The panel can generate 5 volts at 1.2 amps — enough power to charge a smartphone at the same speed as a conventional wall charger. The top-side, opposite the solar panel, features a non-detachable piece of brie cheese, the USBrie, equipped with a USB port and customized power bank connector. The milk bottle power bank, the Solar Milk, directly connects to a port inside the brie cheese and doubles as an adjustable tilt stand. Connection holes allow SunMade Cheese to attach to a window or messenger bag. 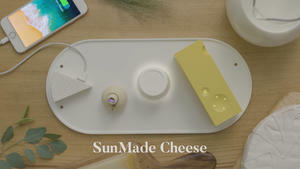 SunMade Cheese is more than just a solar panel. It hosts a potpourri of realistic cheeses designed to practically and easily incorporate solar power into our everyday lives. YOLK has made quite a name in solar power and on Kickstarter. On top of the funding amount, it was featured in more than 300 publications, also won the CES innovation award in 2017. Crucially, YOLK delivered both products to backers on time and with quality seldom seen with Kickstarter projects.